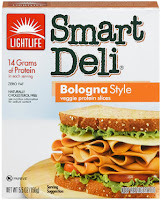 Next up in my Mega Sandwich series is Lightlife Smart Deli Bologna. Now, I'm going to be perfectly honest here and say that it's been years since I last had bologna. I know this is something that I always complain about, at least with the "I haven't eaten meat in forever, but I'm pretty sure this tastes just like it!" kind of reviews that prompted me to start this blog in the first place, but that's how it goes. If you really don't like it, let me know and I'll go buy some bologna and do a head-to-head comparison. I'll make that sacrifice for my readers. In the meantime, however, I do feel like the bologna experience is pretty…distinctive. Not something I'd expect to romanticize. When assembling my mega sandwich, I (unfortunately?) did not have any good, old-fashioned American cheese in my fridge (mostly because it's gross) which I thought would go best with the bologna, so I had to make do with some cheddar. Once assembled, with one slice on this third of the sandwich, I couldn't taste anything. I added a second slice, and still couldn't taste anything over the other ingredients. I had to resort to a naked testing (the bologna - not me) for this one. On its own, I have to say that, other than a slight fake-meat gluten flavor, this was strikingly similar to my memory of bologna, for better or worse. I wonder what this would taste like on some cheap white bread, with some American cheese, maybe (and I don't even like it but…) some mustard. You know, the typical bologna experience. I don't wonder enough to actually go buy the crappy bread and the crappy cheese, however. Feel free to experiment on your own and let me know. In non-fake-meat news, I turned 30 yesterday! Happy birthday to me and also my birthday twin, Eliza Dushku! And for the rest of you, happy new year and be safe out there. Make good choices, as my mom used to say whenever I left the house. See you all next year! This is the first post in a three-part series I'm calling "Mega Sandwich". I had these three lunchmeats in my fridge that were waiting patiently for me to try them out, and, as I've said before, I'm not that big into sandwiches. So what I did was make one sandwich, in three segments, with three different fillings, because I'm cool like that. First of all, I started out with some homemade sandwich bread, because that's what I had. This bread was pretty dense, which definitely had an effect on some of the results, so I ended up tasting each lunchmeat both as part of the sandwich and alone. I also had, on all three parts, a thin layer of mayo, some lettuce, and a slice of tomato. If I was going to call this a mega sandwich, it had to be serious. For the first segment, I used Peppered Tofurky Deli Slices with some swiss cheese. I started each segment out with one piece of each deli slice. When I took a bite of this segment, I tasted the bread, lettuce, tomato, and pepper. Now, this wan't a huge surprise, as it does claim to be peppered, but I did sort of hope to taste something other than pepper. I thought that maybe the rest of the ingredients were drowning out other flavors, so I tasted the fake meat on its own. Alone, it was VERY peppery, with not much else going on. I'm really not a fan of lots of black pepper, so I really didn't like this one. I suspect that if other people like to eat their pepper in lunchmeat format, they'd really dig this, but it's not for me. Meanwhile, for those of you into this sort of thing, have a great Christmas! And for those of you not into it, have a great weekend! Texture - Sort of a dry-lunchmeat-turkey texture. Reasonable in a sandwich, not great alone. 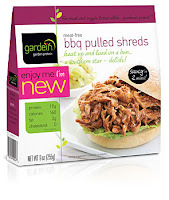 This week, I'm reviewing another Gardein product, since I actually tested both of them at the same meal. It's even another barbecue product: Gardein BBQ Skewers. These got cooked in a skillet with a teensy bit of oil, in the hope that I could get them a little crispy on the outside. The amount of sauce that was in the packet with the two skewers, however, prevented this. They pretty much just got poached in their own sauce, which wouldn't have been a bad thing if the sauce was tasty. I'm just going to tell it like it is here. This claims to be a barbecue sauce, but I tasted no tomato flavor, no vinegar flavor, no smokiness, not even any sweetness. Nothing that even remotely resembled a barbecue sauce. It was a little more like a bad teriyaki sauce. Not a good start. 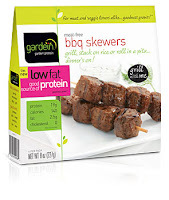 Once I got the skewers heated up, I attempted to pull the fake meat chunks off the skewer, which is when I discovered that they weren't cubes of fake meat, it was one fake meat log with indentations to make it look cubed. This reminded me of one of this big Tootsie Rolls that you don't see too often anymore - the long ones with multiple segments. Please tell me you know what I'm talking about here. Anyway, I ended up cutting the cubes apart so I could get them off the skewer without tearing them. Finally I popped a cube into my mouth. 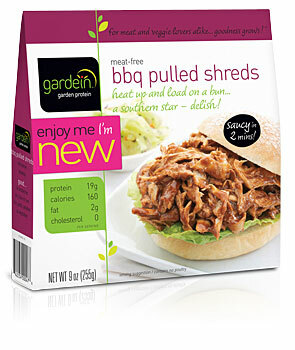 The texture was a little less springy than the shreds I reviewed last week. The flavor though… in addition to the terrible non-barbecue sauce I've already mentioned, there was a horrible aftertaste. I don't know if it was due to the sauce or the fake meat itself, but something unpleasant stuck around. I tried another piece, mainly to drown out the aftertaste, and the experience was pretty similar. No improvement. Maybe with a better sauce this could be something. But as is, no thank you. Flavor - Don't call it barbecue if it's not going to taste anything like barbecue. And the aftertaste was awful. Head over to Let Them Eat Meat to read an interview I did. Hello, everyone! April here -- I'm the webmaster for Adventures in Fake Meat, working tirelessly behind the scenes to make sure everything is running smoothly and is easy to use. As our regular readers know, every product reviewed here gets assigned a letter grade ranging from A+ to F. This makes it easy to determine at a glance whether a food is either a perfect meat substitute, a dismal failure, or somewhere in between. And we've put all those grades in a useful chart, ordered by product type (beef, chicken, etc.) and then by product name. If you've not visited it yet, I highly recommend giving it a look. The average grade across all fake meat reviews is halfway between a B and a B-, or slightly better than average. Hopefully as manufacturers get more experience producing fake meat products, product quality will start drifting towards the "A" end of the scale. This week, I'm testing out something a little different. It's not fake meat, but it is fake food. Fake cheese, in fact! I've always been a little curious about how soy cheese tastes. Keep reading to find out what I discovered. 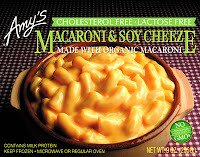 For my first soy cheese experiment, I went with Amy's Macaroni and Soy Cheeze. Now, I really like macaroni and cheese. I'm not a macaroni and cheese snob - I eat the Kraft version (the whole grain one - try it sometime!) just as often (well, almost) as my awesome homemade version. I was really looking forward to trying this product. After heating it up in the microwave, as directed, I got ready to eat it. Unfortunately, immediately upon removing it from the microwave, I was confronted with a horrible stench. It reminded me of two things that both smell the same to me - blue cheese and barf. Neither of these things are even remotely appetizing to me. I know some people like blue cheese, but I really can't understand that. Sorry. So I suspected, maybe the scientists who put this together were trying to imitate blue cheese for some unknown reason instead of the more traditional cheddar cheese. I gave them the benefit of the doubt, hoped as hard as I could that it didn't taste like it smelled, and took a bite. It did not taste like it smelled. Not to say that it tasted good, of course. It was very bland, which improved a little with some salt. The texture was definitely a problem, which is pretty common with frozen macaroni and cheese entrees, but I don't think it was the pasta. The fake cheese sauce wasn't smooth and creamy, like you'd expect from a macaroni and cheese - instead it was gummy. It totally stuck to the inside of my mouth and took a fairly good deal of effort to remove. Luckily it didn't taste as horrible as it smelled, because I'd have been stuck with it for quite a while. For some reason, I decided to give it a few more bites to see if I could get used to it, and four bites in, I was starting to get accustomed to the gumminess of the sauce, but here's the thing. Every time I brought a bite up to my mouth, I caught another whiff of the extremely unpleasant smell, which really interfered with my very moderate enjoyment of the experience. I eventually gave up after the fourth bite or so. It just wasn't worth it. 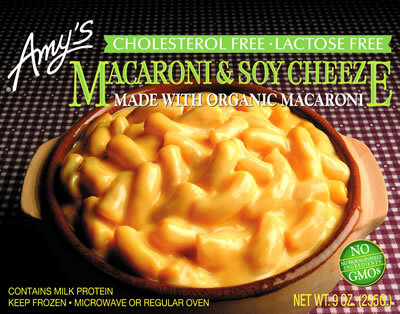 Sorry, Amy - this product just doesn't meet my macaroni and cheese standards. Maybe your real-cheese macaroni is better, but soy cheese just isn't a satisfactory replacement. Flavor - not too terrible if you can get past the smell, but as smell is a big part of flavor, I'm going to have to ultimately say "ew"